This section covers the six full-length dome lounge cars built by Budd in 1955 for service on the Great Northern "Empire Builder". Although they are referred to as "Great" domes, GN applied that term to ALL their domes, including the "short" coaches, using the "Great" to reference their road name rather than the size of the car. Although all were painted in GN colors, 1395 was purchased by CB&Q as its' share of the Empire Builder "pool". The cars were reserved for Pullman passengers. � During the "BN" renumbering scheme of 1970, all of these cars retained their original GN/CBQ numbers. All of them were later sold to Amtrak and became Amtrak 9360-9365. Amtrak later rebuilt 3 of the cars for Amtrak Auto Train service as numbers 9300-9302. GN 1390 "Glacier View" - to BN 3/70 (same number), to Amtrak 9360, used on Amtrak's "Empire Builder" until replaced by Superliners and retired 4/81, then sold/traded (for baggage cars!!!) to the BN in 1983 to become BNA-24 "Glacier View" and was assigned Amtrak private car number 800075. To BNSF ownership 9/95. Smooth siding panels were removed and replaced with fluted siding as BNSF 30 (1997) - car name retained. GN 1391 "Ocean View" - to BN 3/70 (same number), to Amtrak 9361. Was a 1969 "experimental" paint scheme car. It, along with diner "Lake Minnetonka" was repainted by the GN's Dale Street shops (MSP), as FULL width white stripes on both sides without the standard "turn down". The white stripe was straight through the car, effectively making a half green (lower) half white (upper) scheme with black roof and GN Big Sky Blue style lettering and logos. 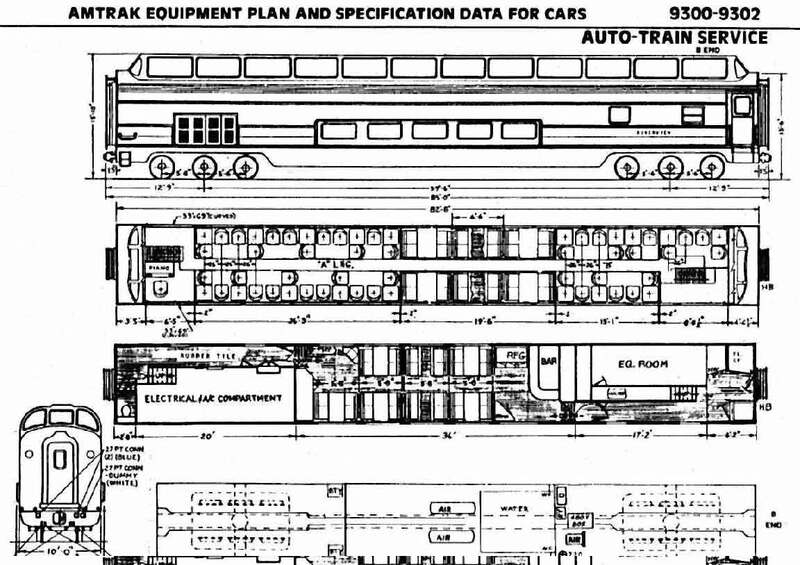 After Amtrak purchase, the car was rebuilt 3/85 with HEP and numbered 9300(2) and used in Amtrak Auto Train service - the name was retained. It was refurbished and renumbered 10031 in 1999 (name removed), and assigned to Corporate Services Unit. As of 2000, it was in active service in the Amtrak "San Diegan" pool. Shipped to Seattle 9/2001 for special train service, with the 'honor' of being the last dome in Amtrak's possession. Served Reno fun/ski trains in winter 2001/2002, then made run on Las Vegas Fun Train May 7-9 2002. Ran intermittent "Surfliner" service beginning June 2002 on the single remaining horizon/amfleet trainset, then moved north for 2003 "Reno Fun Train" usage. Repeated the Surfliner/specials/Reno usage 2003/2004. GN 1392 "Mountain View" - to BN 3/70 (same number), to Amtrak 9362. Was rebuilt with HEP (2/85) and renumbered 9301(2) and used in Amtrak Auto Train service - car name was retained. This car was renumbered 10030 in 1998 (name STILL retained) and was assigned to the Special Services Unit, and was active in Amtrak "San Diegan" pool service in 2000, as well as seeing a large amount of "special train" service (moved to Seattle in fall 2000 for football specials, excursions, and Reno Fun Train in winter). Shipped to Beech Grove mid-2001 for truck replacement, then sidelined due to budget cuts. Sold to Henry Hillman/Oregon Rail Corp for American Orient Express service 9/2001 and moved to AOE at Western Jct WA. Renamed "New Orleans" (800742) and made it's first trip 4/2002. Became part of "Grand Luxe"/AOE, then sold early 2009 to Xanterra with other Grand Luxe equipment. GN 1393 "Lake View" - to BN 3/70 (same number), to Amtrak 9363. Was retired by Amtrak 2/82 and stored in Oakland CA. Southern Pacific purchased the car and scrapped it at the Oakland yards in 1983, using the OSH (outside swing hanger) trucks for their business car "Oakland". GN 1394 "Prairie View" - to BN 3/70 (same number), to Amtrak 9364. Was eventually used as an Amtrak parts car and was sold 5/93 as a shell (less trucks) to the BN. Stored Springfield MO (ex Frisco shops) until sold 1994 to Holland America Westours. After putting over $1m into it, car is now in service in Alaska. It carries the name "Deshka" and entered service in 1997. In 2003 Westours put all but 3 of their Budd domes up for sale as `"excess". They kept 1394 because it required no coupler pocket modifications for the new Colorado Railcar domes and it has Budd braked trucks (from under one of the two 1956 Budd built Santa Fe business cars that were retrucked with 4 wheel trucks in 1989). Car transferred late 2004 to a new division called Alaska Rail Tours (defunct) with the other retained cars to begin service in 2005 in a non "cruise ship" travel/tour operation in Alaska. Sold 10/09 to Iowa Pacific/San Luis & Rio Grande. Renamed back to original "Prairie View". GN (CB&Q) 1395 "River View"